Bereaved families tell PM not to make their pain worse by speaking at ceremony for terror victims after releasing terrorists 3 times. 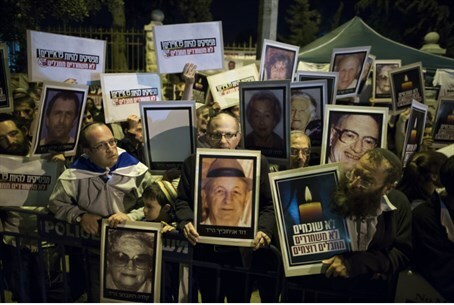 Bereaved families called on Prime Minister Binyamin Netanyahu to refrain from attending the official Memorial Day ceremony for terror victims on Wednesday, in protest over the release of dozens of Palestinian Arab terrorists in the framework of peace talks. Bereaved parents Ron Kerman and Yossi Zur drafted the letter. "Please save us and other families of the victims of terror from your speech this year [on Memorial Day]," the letter reads. "Please do not come to the ceremony on Har Herzl and please do not speak." "Since last year's ceremony you released murderers three times," the letter continued. "Three times that you tore at our hearts and ripped at our flesh! If we were really that important and you really joined us in our grief, you would have had the ability to prevent us from suffering once again for nothing." "We've heard plenty of cliches, slogans and hollow promises in your speeches," it fired. "You do not mean a word of it and we no longer believe in you and any word you say." "Your words will fall on deaf ears [. . .] let go of us and let us unite in peace and dignity with our loved ones," it added. Meanwhile, Knesset speaker Yuli Edelstein (Likud) and Interior Minister Gidon Sa'ar also met with bereaved families Wednesday over ongoing rumors of yet another terrorist release. The families asked the two ministers not to release Israeli Arab terrorists in the event that peace talks return to the national agenda. The two families asked that if political negotiations agenda and will return to the question of releasing terrorists holding Israeli identity cards they oppose such a proposal. Sa'ar confirmed at the meeting that he would oppose the release of Israeli Arab terrorists. "The ongoing negotiations have been called off for the moment and I do not see them returning on the horizon, but when the question of releasing terrorists holding Israeli identity cards will rise again, I will oppose and will vote against it, as I said before," he said. At the end of the meeting, Meir Indor, head of the Almagor terror victims organization, took issue with the State's policies in light of Memorial Day. "You cannot visit the graves of our loved ones on Memorial Day on the one hand, and on the other continue to release murderers," he said. "83 murderers were released this year. You cannot do this and use all tools at our disposal to prevent further releases in the future."